They downshift into first and pop the hood at high speed, just to see what happens. Everyone (yes, everyone) who's driven a car with manual transmission has missed a gear at some point and went down a cog instead of going up. Fortunately, not everyone has experienced the thrill of the hood flying open at speed. These two videos from the crazy guys at mastermilo82 on YouTube showcase both such scenarios, and the potential consequences of those actions. A poor old Opel Astra is the guinea pig for the tests, but it earns our respect for taking a beating and still ticking. Let’s look first at the potential consequences of downshifting when you meant to upshift (in the video at the top of the page). In this case, the plucky Opel gets to a speed of 90 km/h (56 mph) in second gear and is unceremoniously dumped back to first. If you’re lucky, in real-world situations you’d catch the mistake almost right away and get the clutch pedal back in before doing any harm. Not only did these guys not do that, they repeated the test three times. Yikes. Granted, after the first one the Astra’s engine was noticeably down on power so it couldn’t quite reach the original speed, but still, it experienced three over-revving downshifts and kept on running. Sort-of, anyway. 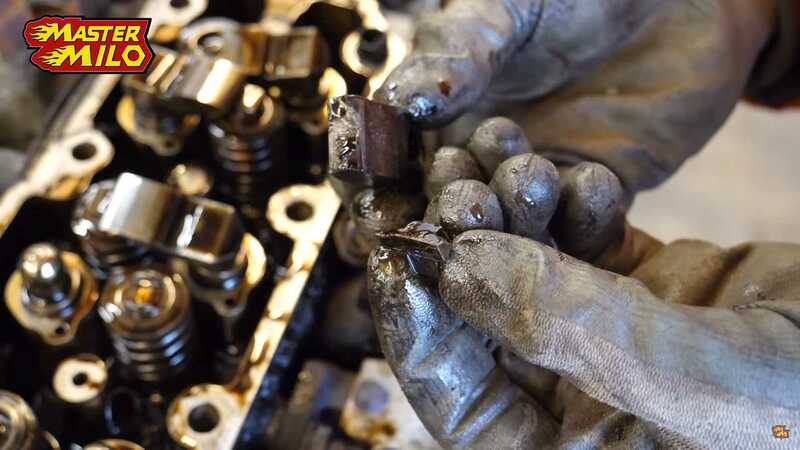 After limping the car back to the shop, a quick teardown revealed that two valve rockers had broken from the high engine speed – a relatively easy fix provided no additional engine damage was done. As for the hood test (featured directly above), this one is a bit more straight forward. One doesn’t typically open the hood in mid-drive, but these guys did and to no real surprise, it came zinging open and flailed back hard against the car. To some measure of surprise, the windshield wasn’t destroyed in the impact, nor did the roof take damage. Judging by the way the hood flexed as it hit the roof, we suspect an old Opel Astra isn’t the highest quality vehicle.